Disclaimer: this blog post has absolutely nothing to do with my life, the events surrounding my job in Shenzhen, or anything else that this blog was originally intended to be about. It is, however, about something far more important than any of that. For the approximately 31 people on the planet that haven't yet heard about the PIPA/SOPA legislation currently being considered in the US, please get out from under a rock and watch this video, then come back and read this blog. ...But I've already written about my love of Wikipedia. So now let's talk about something that would affect not only Wikipedia, but basically every single website on the internet: SOPA/PIPA. I first heard about this proposed legislation from my good friend John on Saturday night. Saturday, as in 5 days ago. He just mentioned that Wikipedia would be blacking out for 24 hours in protest of this new legislation which would be very damaging to the freedom and neutrality of the internet. Yesterday (Wednesday here in China), I posted a Facebook status with a link to Wikipedia's page which outlined their decision to black out for 24 hours, and explained their rationale and methodology of making this decision. At the time, I'd seen a bit more about this on various Facebook statuses, but (and I really don't mean to sound arrogant at all here, just making an observation) I was one of the first people I know of to put anything up about it. Oh boy how that changed. As of last night, I had seen dozens of statuses and photos and rants on Facebook about the proposed legislation. All, obviously, were overwhelmingly against it. This morning, no fewer than 7 of my friends on Facebook had even gone so far as to change their profile pictures to anti-SOPA/PIPA pictures. 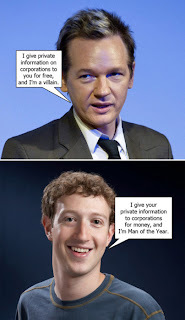 As the creator of this brilliant cartoon notes, Assange is basically viewed as a villain by a large percentage of society. Those who do support Assange still have the rather annoying tendency of viewing him as something of an outlaw, an anti-authority figure that's as much an oddity as he is a revolutionary. He is, in short, considered a rogue curiosity, someone that people may look up to, but would never want to emulate. This is wrong. I saw an interesting piece of writing by Jimmy Wales, founder of Wikipedia yesterday which was talking about this quasi-battle between the powers-at-be and the majority, and it sort of reminded me of a really bizarre technological war, a war obviously not being fought with guns and explosives, but one being fought with idea proliferation, with the majority sending barrages of emails and letters to their representatives, and the representatives replying by attempting to press through our lines with legislation which empowers media companies with horrible tools to restrict a free and neutral internet. Is it possible that this is what the wars of the future will be fought with? Going back to Assange's public perception as a rogue voice against authority--we all have the capabilities of doing what Assange has done at Wikileaks. Maybe not the financial resources, the technical skills, or the network of global connections that Assange has used to push Wikileaks up the Alexa Rankings, but we all have the right, need, and dare I say the duty, to encourage internet and political transparency, freedom, and equality. How can we do this? Well, I think a good example would have been basically destroying a piece of Congressional legislation within a few days. We should not be so complacent as to only do this type of thing when a really, really grievous bill passes through--we should be more actively involved in the political process, all of us (myself included--this has been a wakeup call to the fact that I truly have not given a damn about political involvement, ever. This will change now). Furthermore, continue to spread ideas, upload ideas, make the world a more open and free place! The last 5 days have been incredibly inspirational in that regard--Congress was (is) attempting to pass legislation which will infringe our rights to a free and open internet, and people overwhelmingly slammed the door with an emphatic ambush of "no" in a flurry of Facebook statuses, Tweets, Emails, Google+ updates, and every other tool that the everyman has at their disposal due to the wonderful powers of the internet. The importance of these actions cannot possibly be understated if we are to continue to live in a world with free and open internet. And on a lighter note, a brilliant project that anyone interested in science and good music should check out--a huge thanks to my friend Angelo for introducing me to this project about a month ago, I have been enamored ever since (in addition to the above link to the actual website, the wiki is here). Best quote throughout the entire series of songs, as far as I'm concerned (Full quote taken from a TedTalk c. 2005, paraphrased in song)--" Are there things about the universe that will be forever beyond our grasp, but not beyond the grasp of some superior intelligence? Are there things about the universe that are, in principle, ungraspable by any mind, however superior?" --Richard Dawkins...something to think about! Hopefully a blog post about the ongoings in Shenzhen to come soon--not a whole lot of updates from here apart from lots of work and an impromptu trip to the US back around Thanksgiving, but I guess any day living in a place like Shenzhen is an event within itself, so again, coming soon. In the meantime, the internet is an amazingly powerful tool. Don't let others control it, keep it in the possession of the people. A completely abstract and physically nonexistent tool made by the people, for the people.